When students are given the gift of a three-day weekend, it’s always fun to make sure they know why they’re getting that extra day off. Surprise your students with a pop quiz, and a reminder of the great service each of our presidents provided for our country. Pick and choose from the questions below, or download our free quiz. This Microsoft Word file is editable and contains two pages. The first page can be used for lower grades, and second page can be used alone or with the first for upper grades. Edit to suit your needs and grade level. Click here to download your free Presidents’ Day Pop Quiz. What is the full name of our current president? 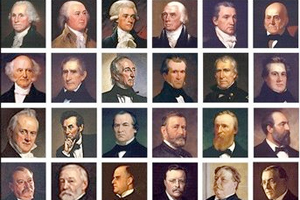 How many Presidents have we had in the history of the United States? Presidents’ Day is observed each year on the third Monday in what month? What is the name of the President’s house? When we place votes to choose a new president, we hold an ___________. What is the name of the ceremony that takes place when a new president is sworn into office? The President is also called the Commander in _________. Name one of the presidents whose birthday is also this month. Was our first president elected or appointed? When a president chooses not to sign a new bill into law, he returns the unsigned bill to the Congress. This special Presidential action is a called a ______. What is the name of the President’s office in the White House?Name two first ladies. What was the nickname of a president, and how did he get that nickname? In what month are presidential elections held? Name a president who died in office. Name a Vice President who went on to become President. Give the name of a Presidential pet, and which president that pet belonged to. Why is there no school on Presidents’ Day?